When we are rewarded for something, we repeat the behavior. That’s human nature. The same is true for sugar. When we consume sugar, it triggers rewards centers in our brain saying that it was a pleasurable experience, let’s do it again. Despite how rewarding sugar may taste, it has both short-term and long-term consequences. Reaching for sweets might promote a temporary state of euphoria, but this is quickly followed with the urge to eat more. The hormonal swings sugar provides leaves us feeling tired, irritable and moody. Over the long-term, it can lead to weight gain and insulin resistance, putting us at risk for diseases like diabetes, heart disease and metabolic syndrome. It may seem like a no-brainer to just cut sugar out completely, but even foods you wouldn’t suspect to have sugar, do. Here are some tips for how to retrain your brain. Natural sugars are those that naturally occur in a food – think fruits, vegetables, milk. Added sugars are those added during processing and preparation – think beverages, sweets and snacks.. The issue is that added sugars are sometimes hard to find when looking through the ingredient list. 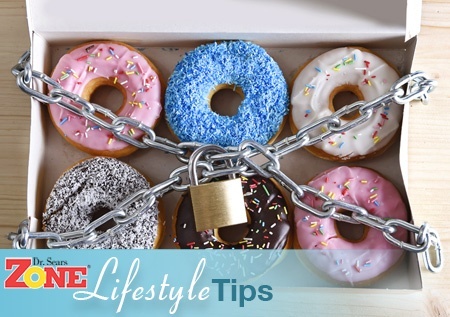 Despite the obvious foods like candy, cakes and pastries, they are often lurking in items you wouldn’t suspect like salad dressings, flavored yogurts, dried fruit, and instant oatmeal. There is good news. The FDA is making sugar easier to decipher with new legislation requiring added sugar to be listed on labels. The bad news is the new labeling won't hit the shelves until July 2018. Note: Companies with less than $10 million in sales don't need to comply with the new labeling until 2019. Still, new labeling is a big deal because the average American consumes about 24 teaspoons of added sugar a day. That's 385 calories a day in sugar! So for the time being, acquaint yourselves with other names for sugar, and do your best to avoid them. Or at least make sure they fall at the end of the ingredient list, not the beginning, then, you should be just fine. 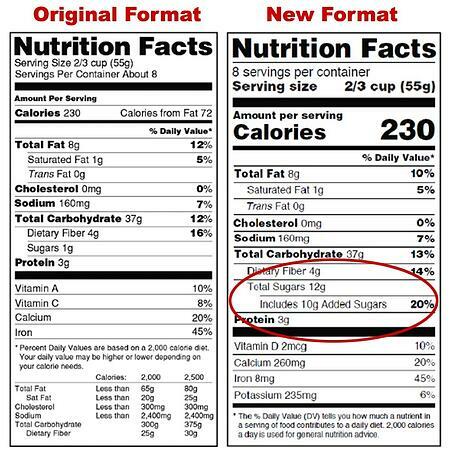 Here's a sneak peek at what the new Nutrition Facts Panel will look like compared to the original format that is on your food products today. If you are following the Zone eating plan your intake of added sugar is minimal. However, if you sometimes let non-Zoned foods creep into your diet here is a good rule of thumb. Women and children should consume no more than 100 calories per day of added sugar, or about 6 teaspoons (1 can of soda). Men should limit intake to less than 150 calories per day, or about 9 teaspoons (about a 12oz bottle of soda). Despite artificial sweeteners being deemed safe by the FDA, the verdict is still out as to whether they might leave you craving more sugar despite being low in calories. Moderation is key. Pay attention to what your body tells you. If you continue to crave more sweets or are starting to gain weight due to increased hunger, look for another alternative. Balance Your Plate: The Zone was designed to help control blood sugar levels and minimize hunger. If you are eating meals balanced in lean proteins, colorful carbohydrates (fruits, veggies) and good fats, it will help to keep you satisfied and decrease your cravings for sweets. Plus, eating small frequent meals throughout the day will lessen the need for the quick fixes because you’ll never get to that point of being ravenous. Check Your Labels: Remember that foods like fruits, vegetables and dairy have natural sugar (plus fiber and protein which slow down digestion), so pay attention to the amount of sugar listed on the label, but more importantly, for those key words in the ingredient list that show sugar has been added. This is especially helpful for foods like yogurt that combine natural and added sugar. Spice It Up: Get more enjoyment from your meals by kicking up the flavor a notch to help provide greater satisfaction. Substitute cinnamon in place of brown sugar in oatmeal, or use extracts like vanilla in plain yogurt to give it a flavor boost. Re-evaluate Your Beverages: Approximately 50% of added sugar intake in the U.S. comes from beverages like soda, energy and sports drinks, fruit juices and teas. Finding lower-calorie substitutes for these or cutting them in half with water can easily help to minimize the amount of sugar we get on a daily basis. Know Your Triggers: Come up with a plan for when you typically look to sugar as a reward – whether it’s the mid-afternoon slump, the dessert that never ends, or stress in general. If you have healthier snack choices on hand or know you have something to reach for in these situations, you’ll be less like to go overboard. Start Slow: For some people, sugar is truly an addiction, so going cold-turkey may not work. Try cutting out one sweet thing from your diet a week, or reducing the portion on something you regularly have. 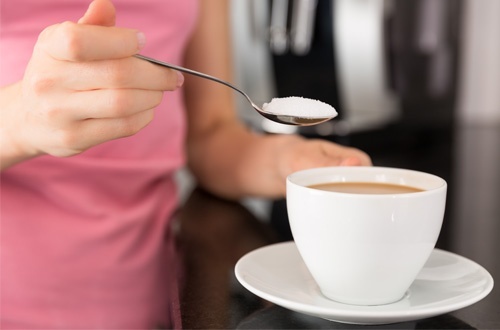 If it’s sugar in your coffee, consider cutting the amount you use in half to start and gradually reduce from there. If it's dessert, try cutting back on the frequency and your body will eventually adjust. Even on the Zone Diet eating plan, you can have an occasionally treat. If you can keep the added sugar that comes in condiments, confections, and starchy bread products to a minimum more often than not, then a sweet treat balanced with the rest of your meal can still fit within the context of a healthy diet. A lifetime of wellness can be pretty sweet, even without the sugar. What are added sugars? USDA, Choose My Plate, August 16, 2016. Added Sugar. American Heart Association, July 20, 2016. Sugar: Too Much of a Sweet Thing. Center for Science in the Public Interest, March 1, 2013.